This article is part 2 of a series. You may want to read part one of Basic Concepts of Refined Coal Tar Based Sealcoatings, Part 1, first. 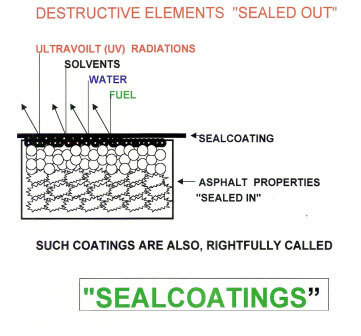 The terms 'sealcoating', 'sealer', 'seal' denote the very fact that these coatings seal or lock in the properties of asphalt and protect it from deterioration. Asphalt thus protected retains its cementing, waterproofing and flexural properties. The next obvious question is what will realistically protect and preserve asphalt pavements? The choice is clearly refined coal tar based sealers. Coal tar, the main ingredient of the sealcoating products, has an altogether different origin and chemistry. The major difference comes from the very origin of coal versus asphalt. Coal, the source of coal tar, finds its origin in plant and vegetation, which were successively buried under the earth and degraded over millions of years. Petroleum, the source of asphalt, originates from the degradation of marine life, which also got buried and degraded over millions of years. The chemistries and structures of plants and marine life are significantly different and therefore are a reason for the major difference in properties of coal tar and asphalt. Crude coal tar is a by-product of conversion of coal to coke production by the steel mills. Coke is used in the metallurgy of iron and steel. The crude tar thus obtained is further distilled under controlled conditions to separate the lighter fractions like benzene, phenols, cresols, tar oils etc. and what remains at the bottom fraction is coal tar pitch. The coal tar pitch is further refined to produce various grades of the pitch, named as RT (Road Tar) grades 1 to 12. Refined grade, RT-12 is commonly used for sealer manufacturing. It is, therefore, a very select fraction of the pitch from which a majority of the lighter fraction has already been removed. Coal tar is also a very complex mixture of over 5,000 chemical compounds, which are prominently different from the compounds in asphalt. The chemical compounds in coal tar are predominantly closed ring (aromatic) in structure and quite stable. By virtue of their molecular structure they resist deterioration by ultraviolet or attack by chemicals, oil, grease and other petrochemicals. The chemical structure of the molecule does not have very many sites of instauration where the chemical or weathering elements could possibly attach and degrade the molecules. Additionally, coal tar is also one of the best waterproofing materials known, with excellent aggregate binding properties. Several years ago, coal tar was used for road construction and is still widely used for roofing. For convenience in handling and application, refined coal tar is dispersed in water, with the help of select clays, emulsifiers and specialty chemicals. Such coatings are commonly called ‘coal tar pitch emulsion'(C.T.P.E.). 1. Protection of the pavement against the damaging elements of weather, chemicals, oils, deicing salts, etc. 2. Preservation of your investment as the life of the pavement will be easily doubled at a cost of about 20% of the original pavement. 3. Improved appearance. Appearance is the key to image and success, which in turn translate into improved business. 4. Cleaning is made easier. Rain washes and cleans the sealed pavement much better and snow removal is much faster than on unsealed pavements. 5. Striping will last longer thus reducing the frequency of re-striping. The sealers based on asphalt deliver a majority of the same properties except protection against weathering, salts and various chemicals. Asphalt based sealers have distinct advantage over refined coal tar sealer for being easier to handle, devoid of strong odor and much less suspect for skin photosensitization. Asphalt based sealers have been used for many years with considerable success and the choice is entirely with the requirements of the project and preference. 1. Be non-porous to the extent that it will not allow water, oils, chemicals etc. to penetrate and reach asphalt in the pavement. 1. The general composition of sealers. The various ingredients and their relative proportions. 2. Mix designs i.e. what other materials are mixed with the sealer before it is applied onto the pavement. How does the mix design influence the performance? 3. How much to apply and how does the film thickness influence the performances. There are very many other factors e.g. weather, temperature, humidity, wind velocity etc. that greatly affect the rate of drying, film formation, and the overall performance of the sealer. Due to the scope of this article, we will not be able to discuss all these aspects. Read part 3 of this series about Coal Tar Sealers, Basic Concepts of Refined Coal Tar Based Sealcoatings, pt. 3. You can also visit the Star Seal website to learn more at http://www.starseal.com.